Gnats are non-biting insects found in damp habitats such as ponds, wetlands and even around your home in old bird baths or gutters. Gnats can find their way into homes, congregating around moisture for breeding. A turtle habitat makes a suitable gnat habitat, too. 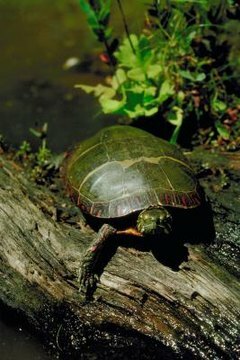 You can rid them from your turtle's aquarium various ways. Relocate your turtle into a temporary tank. Remove all substrate from the tank; scrub the accessories with water and let them dry. Dump the water from the aquarium and spray it with fresh water. Do not add bleach or other harmful cleaning products. Instead, use turtle-safe cleaning products found at pet care stores. Scrub the tank down and rinse it out. Add new substrate and replace the accessories. Replace old filters. Fill the tank, start the filter system and replace your turtle. Clean the tank as often as you feel is necessary, such as when the water becomes cloudy. At a minimum, perform a thorough cleaning once per month. Protective barriers like screen covers can help keep out gnats and other insects when placed on the top of your turtle aquarium, but only if you get the right kind. When shopping for a cover for your aquarium, do not shop for solid covers made of glass or plastic. Louvered plastic won't work, either: The cover has to have tiny holes, such as a screen, to promote air circulation and leave out the miniscule bugs. Without holes, the temperature and humidity in the tank with increase and create a dangerous environment for your turtle. Besides cleaning properly and regularly, you can adopt some other proactive measures to prevent gnats from setting up camp. Remove and clean substrates such as rocks, pebbles, plastic plants and floating turtle docks as needed. If you use real plants in your turtle tank, replace them before they start to decompose. If you place any fruits or vegetables in your turtle's aquarium for him to eat, remove them if he does not eat them within a few hours. Having a separate feeding tank also helps prevent gnats.